It seems like for the last several years, I haven't had much time to read fiction. While I used to go through a couple books a week, now it sometimes it takes me weeks to get through a single novel. So I was having lunch with my Hot Mom yesterday, and she mentioned a friend of hers listens to audio-books when she's working, and loves them. So I thought, why not? On my way home, I stopped by our local library and checked this out. I loaded it into my iTunes, and listened to the first CD this morning while I was grocery shopping. So far, so good, but I can see how the person hired to read the book can make all the difference in the world. If any of you Hot Chicks and Smart Men have any experience with these, let me know your thoughts! I've tried audiobooks while at work before, back when 90% of my job consisted of mindless tedious tasks. As you say, the reader is important. But then I got spoiled when I listened to the Hitchhiker's Guide radio show, which has sound effects and such. I wish there were more radio shows around. If I were to get into it again, I'd probably look for standup comedies or something. I love audiobooks, especially for roadtrips and when I'm in a hotel room and can't sleep. A good narrator does make all the difference in the world, and for me the topics too. I tried listening to "erotica" on audio, but it just didn't work for me on ANY level. Hitchhiker's Guide is wonderful. I've not been able to get into the Pratchett audio, and I luuurrrrvvvv the books. Good luck with it, I hope you find something you like. Whenever I've had a long repetative project, like knitting, embroidering, drafting, or drawing (especially when I was in school), I'd listen to books on CD. Even now, when I have a simple task, like paperwork or minor data entry, I'll listen, because there's a part of my mind that demands to be entertained. That part can listen, while the rote part of my brain can do a task. Right now, I'm listening to Pillars of the Earth, by Ken Follett. Very good book. I would LOVE to listen to Jon Stewart. I own Stephen King's audiobook version of On Writing (half autobiography, half treatise on writing). Thanks for the suggetions, guys. Anne, I'll probably try "Pillars" next. I wanted to read it, but the length was a bit intimidating when my reading time is so precious. Reading, precious, we loves it! 1) I used to listen to audiobooks all the time at my last job. Except that I tended to listen to non-fiction. If you do want non-fiction, I loved listening to Karen Armstrong's books read by her. A History of God is one of my favorites. As far as fiction, one of my all time favorite audiobooks is "Small Vices" by Robert B Parker and read by Burt Reynolds. Don't laugh! Burt Reynolds did a perfect job of it. 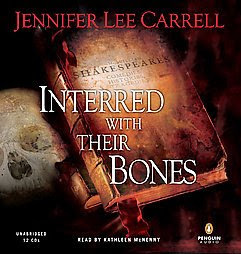 I also liked listening to Shakespeare's plays on audio book, since I am incapable of parsing them in written form. Love audio books. Love 'em, love 'em, love 'em. The reader makes a big difference. There were many books I wanted to go through but the reader just killed the text. The best book I've found so far is still Christopher Moore's "Dirty Job" read by Fisher Stevens. It is not exactly work safe, but his reading makes a funny text hilarious. I have all the Harry Potter books read by Jim Dale who does a great job (also have read the text myself). Stephen King's "On Writing" narrated by Mr. King himself is excellent, especially if you want to write. Some of his other stories the audiobooks haven't appealed to me. C. Moore's "The Stupidest Angel" is also pretty good. The various D. Adams' Hitchhiker's Guides (various readers including Mr. Adams). Also, there's the various podcasts of fiction (Escape Pod - SF, PodCastle - Fantasy, and Psuedopod- Horror). The library is a great resource for them. That way you get to try them out first. Steve, thanks for the recommendation. I've reserved the "Dirty Job" title at my library. Love 'em. Wish they were less expensive. Perhaps I'll check the library, although I'm sure our library charges for them. Rat bass turds. The Morgantown Public Library does NOT charge for borrowing audio books. Shawn, mine doesn't charge, either, although you usually have to reserve them, since there aren't very many copies available. Yeah, we had a comment discussion somewheres a few months back regarding my library, and it's douchebag charging fees. Ugh.